The AV72 is a self-contained solar powered omni-directional aviation light with tactical IR mode, 128bit encryption and encrypted 2.4 GHz radio control. 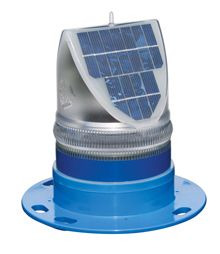 The AV72 solar powered LED airfield light has an internal RF module and antenna to receive encrypted command messages from the handheld radio controller. The radio system uses a mesh network to expand the working range indefinitely. Lights can be assigned to a light group (up to 16 distinct groups) to allow individual control of separate light groups (runways, helipads, taxiways, obstruction) within an airfield or for multi faceted covert and overt operations. The model will operate maintenance-free for many years, and has been tried and tested in some of the world�s most demanding regions including Iraq, Afghanistan, and the Australian Outback. Maximum Available Intensity - Up to 21.9cd (flashing). Up to 9.0cd (steady-on). Warranty - 3 years. Subject to standard terms & conditions.